Study participant Haley Huff, and Physical Activity and Health major, Blake Brown. Still sore from last week, Haley Huff comes to the Auburn University School of Kinesiology over the noon hour to work up a sweat. She does a back squat as Ph.D. student Ashley Hoden reminds her to keep her feet shoulder width apart and her head up. This is “A” day, which means weight lifting, in addition to running on a treadmill and doing abdominal exercises. For one hour a day, three days per week, for 13-weeks, 31 women have committed to coming to the gym and pushing themselves. 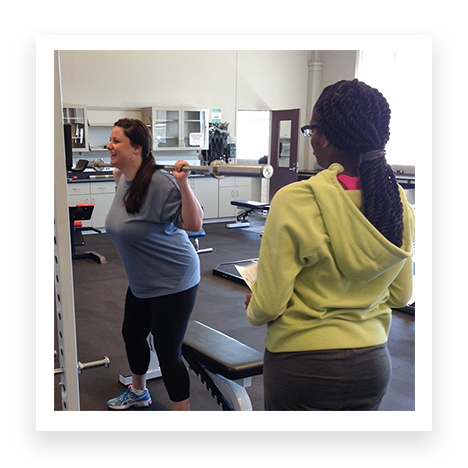 With the personal training guidance of graduate and undergraduate students in the School of Kinesiology, the women complete high intensity interval training (HIIT) at the Performance and Health Optimization Center consisting of cardio on a treadmill, weight lifting, body weight exercises, and core work. Dr. Danielle Wadsworth, Associate Professor and director of the Exercise Adherence and Obesity Lab, is conducting the study on women aged 25 to 55 with a BMI of 25 or higher to investigate adherence to exercise in overweight and obese populations. Individuals with a BMI of 25 to 29 are considered overweight, while a BMI of 30 or over is considered obese. The goal of the study is to look at changes in physical activity after completion of the program as well as the effect of the program itself. The pre-study testing of each participant involved recording height and weight; completing a Bruce Protocol test to measure VO2 max; a DEXA scan to measure lean mass, fat mass, bone density, and BMI; and a Physical Activity Readiness Questionnaire (PAR-Q). The researchers will record these same measures again after the study to analyze any changes. They will also follow up with the subjects at nine weeks post and three months post with a survey, food log, and accelerometer measure to investigate whether they are continuing to exercise. These women are not the only ones dedicating time and energy to the study. Hoden wakes up at 5:00 a.m. every Monday, Wednesday, and Friday to facilitate the morning group of the study, and doesn’t leave until almost 7:00 p.m. after the evening group finishes. Additionally, about 30 undergraduate students and four graduate assistants are helping with training the participants and ensuring compliance with the study protocol. Some women do A-B-A, then B-A-B the next week, and others are the opposite. “B” days involve body weight exercises, instead of weight lifting. The treadmill cardio consists of three sets of one minute intervals (40 seconds work and 20 seconds rest), with a one minute break; followed by another three sets of one minute intervals. They will eventually work up from six sprints to nine sprints. “Our hope is that they leave with a good attitude and continue to exercise,” said Hoden. Hoden comes to Auburn from Columbus State where she earned her BS and Master’s degrees in exercise science. She has an interest in obesity and human athletic performance. She is now working on her doctoral degree under Dr. Wadsworth. Dr. James McDonald, Assistant Clinical Professor, and Dr. David Pascoe, Humana-Germany-Sherman Distinguished Professor and Assistant Director of the School of Kinesiology, are also assisting with the study.